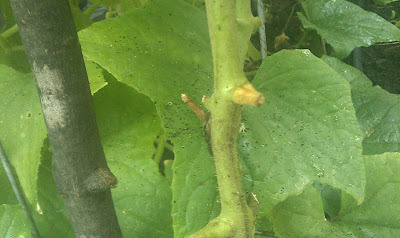 Healthy cucumbers after 6 weeks in SIP. Note the tepee (left) and another type of bamboo stick support with trellis (right). Healthily cucumbers, peppers, lettuce and Swiss chard in SIP. 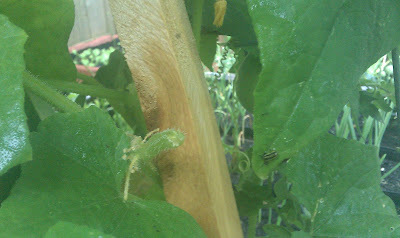 Cucumbers are susceptible to bacterial wilt that is transmitted by striped and spotted cucumber beetles. 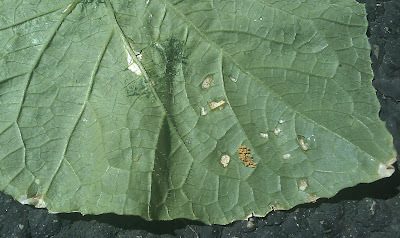 Plants are infected with the bacterial wilt disease by the attack of cucumber beetles. The disease organism overwinters inside the beetles' bodies. How to recognize bacterial wilt? 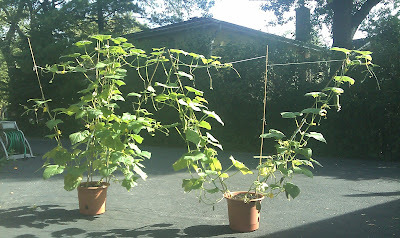 The most obvious symptom of cucumber wilt is vines that have been well watered suddenly wilting. Before this happens though the leaves of your vines will exhibit dull green patches. However, the onset of the disease is so fast that you may never notice this dullness. 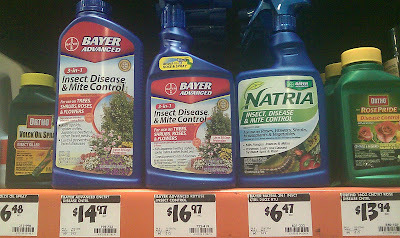 Plants usually are infected with the disease-causing bacteria long before they show any symptoms. 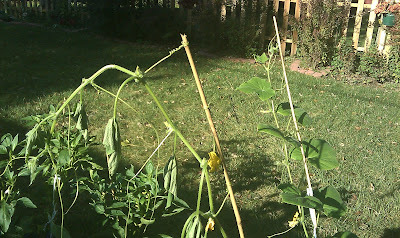 When the vines wilt and collapse (usually about the same time that the first cucumbers are half grown), it is too late to prevent the disease. How to control bacterial wilt? The best method for control of this disease is to control the cucumber beetles. 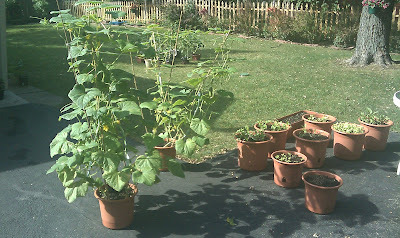 The slicing cucumber cultivar 'County Fair' has some tolerance to bacterial wilt. 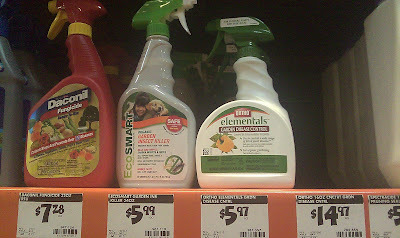 Eureka cucumber is not just tolerant but resistant to multiple diseases typically affecting cucumbers in the tropics.